Absorption: The process by which incident radiant energy is retained by a substance. Advection: Horizontal transport of an atmospheric property. Aerosols: Tiny solid or liquid particles that are suspended in the atmosphere. Air mass: A large body of air that has similar weather characteristics, particularly temperature and humidity. Air pollution: Contaminants present in the atmosphere such as dust, gases or smoke. Albedo: The percentage of light reflected by an object when it is illuminated. Altocumulus (Ac): Clouds in the mid-troposphere that are gray or white in color and that occur as layers or patches with vertical development. Altostratus (As): Layered clouds in the mid-troposphere that are gray or bluish in color. Amplitude: Half the height from the crest to the trough of the wave. Angle of inclination: Tilt of the Earth with respect to the imaginary plane linking the centers of the Sun and Earth. The term is also to orbits of other planets and satellites. Anthropogenic: Resulting from human activities. Anvil Cloud: The upper flattened portion of a cumulonimbus cloud that spreads out when it meets the tropopause. Aphelion: The location in the orbit when Earth (or any other planet) is farthest away from the Sun. Atmosphere: The envelope of air surrounding the planet Earth and held in place due to the Earth's gravitational attraction. The Earth's atmosphere is subdivided vertically into the troposphere, stratosphere, mesosphere, and thermosphere. Atmospheric window: A narrow range of wavelengths in which the atmosphere absorbs very little of the Earth's emitted energy. The best-known atmospheric window occurs between 10 and 12 microns. Biomass: The total amount of living material in a given system. Blackbody: A hypothetical object that is a perfect absorber and emitter of radiation. Calorie and Joule: A unit of energy. The amount of energy required to increase the temperature of one gram of water by one degree C.
Carbon monoxide (CO): A colorless and odorless toxic gas. It is found in the atmosphere at different levels of concentration. Carbon dioxide (CO2): A critical atmospheric gas necessary for photosynthesis. Carbon Dioxide is a major greenhouse gas produced by the burning of fossil fuels. Celsius temperature scale: A temperature scale where the freezing point of water occurs at 0°C and the boiling point at 100°C, at sea level. Chlorofluorocarbons (CFCs): An anthropogenic compound invented by chemists in 1928 considered to be a major contributor to the development of the stratospheric Ozone hole. Cirrocumulus (Cc): Thin, ripply convective high clouds. Cirrostratus (Cs): Layered high clouds that are whitish in color and usually fibrous, but sometimes smooth, in appearance. Cirrostratus often produce optical effects such as halos. Cirrus (Ci): High clouds composed of ice-crystals that are whitish in color and can appear as filaments, patches or narrow bands. Climate: A representation of a region's weather over a given period of time. A region's climate is often characterized in terms of the average and variation of the climate system over periods of a month or more. Climatology: The description and study of climate. Cloud: An ensemble of water drops and/or ice particles in the atmosphere above the earth's surface. Coalescence: The merging of cloud drops into a single drop after a collision. Cold front: A type of front where colder air replaces warmer air. Comma cloud: A features of extratropical cyclones observed in satellite pictures where the cloud system resembles the comma punctuation mark. Condensation: Change from water vapor to liquid water. Conduction: The transfer of energy from one object to another due to the random motions of molecules. Conduction of heat is a consequence of the temperature differences between two objects in physical contact. Convection: The transfer of energy by the movements of masses in a liquid or a gas. In meteorology, convection infers vertical movement or upward motions due to differential heating. Convective clouds: A cloud that results from convection. Convergence: The horizontal coming-together of air that can lead to lifting. Crepuscular rays: Beams of light from the sun caused by a combination of shadows and scattering. These light and dark bands usually occur at twilight. Cryosphere: The part of the planet Earth covered with permanent ice. Cumulonimbus: Precipitation-producing thunderstorm clouds with a flattened anvil-shaped top. Cumulus: Low clouds that develop as individual, detached elements with sharp outlines. The cloud has a flat base and bulges upward. Cumulus stage: The initial stage in the life cycle of a thunderstorm. Cyclogenesis: The development of a cyclone storm..
Density: The ratio of the mass of a substance to the volume it occupies. Derecho: An hours-long windstorm associated with a line of severe thunderstorms. It is due to straight-line winds, not the rotary winds of a tornado. Dew point: (or dew point temperature)The temperature to which air must be cooled at constant pressure and constant water vapor content to become saturated. Diffraction: The process by which radiation changes direction and spreads out. Dispersion: The process in which white light separates into its component colors. Diurnal: Daily, pertaining to actions completed within or that recur every 24 hours. Divergence: The horizontal spreading of air that can lead to sinking motions. Doppler radar: A radar that indirectly measures the wind speed by detecting the change of frequency due to the Doppler effect on radar waves that hit moving precipitation particles. Eccentricity: The deviation of an ellipse from a perfect circular shape. Electromagnetic Spectrum: Electromagnetic radiation arranged in order of frequency or wavelength. El Niño: Warming of the equatorial Pacific Ocean between South America and the Date Line. Energy: The capacity to do work. Energy must be conserved, though it can be converted between different forms. Equinoxes: The time at which the Sun passes directly overhead at the equator at noon. Evaporation: The change of liquid water to water vapor. Eye: The clear area of lowest pressure at the center of a strong tropical cyclone. Eye wall: The circular region of strong thunderstorms immediately surrounding the eye. Exosphere: The uppermost layer of the Earth's outer atmosphere. Fahrenheit temperature scale: A temperature scale where the freezing point of water occurs at 32 degrees and the boiling point at 212 F, at sea level. Feedbacks: A sequence of interactions where one change leads to some other change, which can act to either reinforce or inhibit the original change. Fog: A cloud that is in contact with the ground. Force: The mass of an object multiplied by the change in its speed and/or direction (acceleration). Frictional force: The resistive force caused by wind blowing over the Earth's surface. Frontal lifting: The forced lifting of warm, less dense air over colder air in the vicinity of a front. Front: The transition zone between two air masses of different density. Fujita scale: A rating system designed to estimate the speed of tornado winds based on the damage patterns caused by the tornado. Funnel cloud: A tornadic circulation that does not reach the ground. Geostationary Satellite: A satellite in a geostationary earth orbit (GEO), circling the earth once every 24 hours. At an altitude of approximately 36,000 km, the satellite appears stationary over a fixed point at the equator. Gravitational force: The product of mass and gravitational acceleration. Gravity: The mutual attraction between two or more objects. Greenhouse effect: The heating of the planet that results from the fact that the atmosphere absorbs and emits infrared radiation. Greenhouse gases: Gases in the atmosphere that are effective absorbers of infrared radiation and ineffective at absorbing solar radiation. Greenhouse warming: The possible heating of the planet over and above the natural greenhouse effect as a result of increases in atmospheric carbon dioxide. Halos: Whitish or colored rings or arcs around the sun or moon that are produced by refraction of light by ice crystals. Haze: A suspension of small particles in the air, which reduces visibility by scattering light. Heat: A form of energy transferred between systems because of the temperature differences between them. Heat advection: The transfer of energy through the horizontal movements of the air. Hurricane: A tropical cyclone found in the Western Hemisphere. See tropical cyclone. Hydrocarbons: Compounds made of hydrogen and carbon atoms. Hydrologic cycle: A complete description of how water moves between the atmosphere, water surfaces, and land in all three phases. Index of refraction: A measure of how optically dense a substance is. It is the ratio of the speed of light in a vacuum to the speed of light in a substance. Insolation: The amount of solar radiation reaching the top of Earth's atmosphere. Intertropical Convergence Zone (ITCZ): A convective region separating the trade winds. Ionosphere: The uppermost atmospheric shell characterized by a high ion density. Isobaric charts: These maps depict weather on constant pressure surfaces and include information on the temperature, wind speed and direction, humidity, and the altitude at a given pressure. Isobar: A line connecting regions with the same atmospheric pressure. Isopleth: A line on a map connecting locations with the same value of a variable. Isotach: A line connecting locations with the same wind speed. Isotherm: A line connecting locations with the same temperature. Jet stream: A narrow region of relatively strong winds (i.e., wind speeds greater than 70 knots) usually located in the upper troposphere. Joule: A unit used to measure amounts of energy. One Joule equals 0.2389 calories. Kelvin temperature scale: A temperature scale of primary importance to thermodynamics where the freezing point of water occurs at 273.16 K and the boiling point at 373.16 K, at sea level. Kinetic energy: The energy an object posses because of its motion. Kirchhoff's Law: Objects that are good absorbers of radiation are also good emitters of radiation. Lake breeze: A wind that blows onshore during the day around large lakes. Land breeze: A wind that blows offshore, from land to water. Lapse rate: The decrease of temperature with increasing altitude. Latent heat: The amount of heat taken in or released by water when it changes phase. Lightning: A huge electric discharge that occurs between the ground and a cloud, between clouds, or within a cloud. Lithosphere: The solid portion of planet Earth, or landcover. Longwave radiation: Radiant energy characterized by wavelengths primarily between 4 and 100 *m with a maximum near 10 *m. Also known as Terrestial radiation. Mesocyclone: A vertical column of rotating air within a severe thunderstorm. Mesopause: The top of the mesosphere dividing the mesosphere from the thermosphere. Mesosphere: The region of the atmosphere above the stratosphere, between the stratopause and mesopause. The mesosphere lies between approximately 50 and 95 km. Meteorology: The study of the atmosphere and the ways weather is affected by interactions with the Earth's land and water surfaces and living things. Methane (CH4): A greenhouse gas produced by the decomposition of human and animal waste along with carbon based materials such as coal, petroleum and bogs. Microns: also called a micrometer, a unit of length equal to one millionth of a meter. Millibars (mb): Units of atmospheric pressure. The average atmospheric pressure at sea level is 1013.25 mb. Molecules: Composed of atoms, molecules are the smallest units of a substance that retain the chemical properties of that substance. Momentum: The product of mass and velocity. Newton's Law of Gravity: The gravitational force between a pair of objects. Nimbostratus: A precipitation-producing layered clouds. Nitric oxide (NO): A byproduct of high temperature combustion, such as in automobile engines and electric power generation. Nitrogen dioxide (NO2): A gas found at all levels of the atmosphere, it is also emitted by automobile engines. High concentrations of NO2 give polluted air its reddish-brown color. Obliquity: The angle between earth's orbit plane and the plane of the earth's equator, the tilt of the earth. Currently, this value is approximately 23.5°. Occluded front: A front that forms as a cyclone moves deeper into colder air. Ozone (O3): A chemically active molecule in the atmosphere. Ozone layer: A layer in the stratosphere with a maximum of ozone concentration. Ozone Hole: A depletion of stratospheric ozone that occurs over the Antarctic continent each spring. Particulates: Airborne solid and liquid aerosols that, when in high concentrations, seriously affect the lives of people and animals, harm plants, or threaten ecosystems. Perihelion: The point on the Earth's orbit when it is closest to the Sun. Photons: Particles of light, the elementary quantity of radiant energy. Potential energy: The energy an object has by virtue of its position. Power: The rate of change of energy over time, often expressed in watts. Precession: The wobble of the Earth's axis. This alters the relationship of the solstices with the distance from the Earth to the Sun. Precipitation: Liquid or solid water particles that falling from clouds that reaches the ground. Pressure: Force per unit area. Pressure gradient force: Change in pressure over distance, divided by the air density. 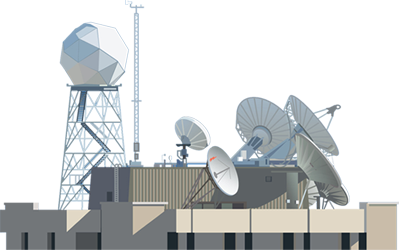 Radar: An instrument used for detecting the presence and distance of objects, such as rain drops, by scattering radio energy. Radar echo: The energy scattered back from a target and detected by the radar receiver. The amount of energy received by the radar is the reflectivity. Radiation (Radiant energy): Energy that moves through space or a medium in the form of a wave with electric and magnetic fields. Also called radiant energy. Radiometer: An instrument that measures radiation power. Radiosonde (Rawinsonde): An instrument package carried upward by weather balloons to measure the vertical profile of atmospheric temperature, relative humidity and pressure from the surface into the stratosphere. The wind direction and speed are measured by tracking the weather balloon's motion. Rainbow: An arcs of the color spectrum caused by the reflection and refraction of light by raindrops. Reflection: The process in which energy incident on the surface is turned back into the medium through which it originated. Refraction: The process in which the direction of energy propagation is changed due to spatial variations in properties (e.g. density) of the medium. Relative humidity: The ratio of the observed vapor pressure of the air to the saturation vapor pressure, expressed as a percentage. Relative humidity indicates how close the air is to saturation. Remote Sensing: The technology of acquiring data and information about an object without having physical contact with it. Saffir-Simpson scale: The system by which hurricanes are classified on a scale from 1 (minimal hurricane) to 5 (catastrophic hurricane), based on potential wind and seawater damage. Scattering: The process by which light rays change direction of propagation through the interaction with particles, such as molecules aerosols and cloud particles. Sea level pressure: The atmospheric pressure any location would have if it were at sea level. Shortwave radiation: (solar radiation) Radiant energy with wavelengths between approximately .2 and 4 microns. Sidereal: Relative to the stars. Smog: Originally a combination of smoke and fog, this term is now used to describe mixtures of pollutants in the atmosphere. Solar constant: The amount of solar radiation received at the top of the Earth's atmosphere on a surface perpendicular to the incoming radiation at Earth's mean distance from the Sun. Its value is about 1370 watts per square meter. Solar time: The time associated with the diurnal motion of the sun across the celestial sphere. Solar zenith angle: The angle at the earth's surface measured between the Sun and an observer's zenith. Solstice: Occurs twice a year when the noon sun is overhead at its farthest north (on or about June 21) or south (on or about December 22) latitudes. On these days, the amount of daylight is at maximum and minimum, respectively, in the Northern Hemisphere. 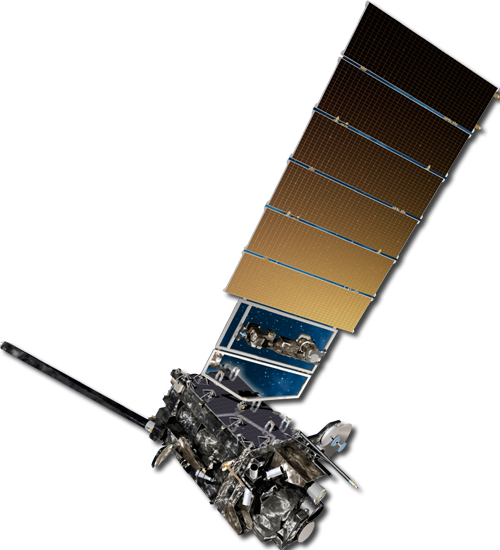 Sounder: A critical satellite instrument capable of producing a vertical profile of the atmosphere. Sounding: The vertical distribution of temperature, moisture, wind speed (and direction) over a location. Southern Oscillation: A seesaw in atmospheric pressure between the western and eastern Pacific that is commonly associated with El Niño and La Nina. Specific heat: The amount of energy needed to raise the temperature of one gram of a substance one degree Celsius. Spectral bands (regions): Segments of the Electromagnetic Spectrum (EMS) bound by a set of wavelengths. Station model: An efficient method of representing weather conditions at a single location graphically on a weather map. Stefan-Boltzmann Law: A fundamental radiation law a that states that the total energy emitted by a blackbody is proportional to the fourth power of its temperature. Storm surge: A surge of seawater pushed onshore primarily by winds of a storm. Stratocumulus (Sc): Low clouds that appear in rows or patches and are white or gray in color. Stratopause: The top of the stratosphere, delineating the stratosphere from the mesosphere. Stratosphere: The region of the atmosphere above the troposphere and below the mesosphere. It is characterized by a temperature inversion where temperature increases with height. Stratus (Sc): A cloud layer with a uniform base and a gray color. Sublimation: The process of ice changing phase into vapor. Sulfur dioxide (SO2): An acidic gas found in the atmosphere, released through the burning of fossil fuels that contain sulfur and some volcanoes. Sulfur trioxide (SO3): Released into the atmosphere primarily through the burning of fossil fuels that contain sulfur. Sun glint: An example of reflection of sunlight by gently rippled water. Sun pillar: A shaft of light extending vertically from the rising or setting sun. Sundogs: Also called parhelion. Bright colored regions that flank the sun due to refraction of light through ice crystals. Supercooled water: Liquid water that is below 0°C. Surface temperature: The air temperature measured in the shade at 1.5 m (or 5 ft) above the ground. Synoptic: Pertaining to an overall view. Temperature: In an ideal gas, the average kinetic energy of its molecules. Thermosphere: The upper layer of the atmosphere extending from the mesopause into outer space. Tornado: A violently rotating column of air that extends downward from the bottom of a thunderstorm to the ground. Tornado alley: A region of maximum tornado occurrence, often defined to be in the Great Plains from Texas to Kansas. Trace gases: Gases found in the atmosphere in very small amounts. Transpiration: The process by which plants release water vapor into the air. Tropical cyclone: Storms driven by atmosphere-ocean interactions and originating in the over tropical oceans. Tropopause: The boundary between the troposphere and the stratosphere. Troposphere: The lowest of the four main layers of the atmosphere. Most weather occurs in the troposphere, the 10-20 km of the atmosphere envelope closest to the Earth. Typhoon: Tropical cyclones found in the western Pacific. Ultraviolet Radiation: Electromagnetic radiation with wavelengths between approximately .2 to .4 microns. Updraft: A current of air that has a marked upward vertical motion. Updrafts keep cloud particles suspended in the air. UTC (Universal Time Coordinated): The time standard used around the world by meteorologists, referenced to the time at Greenwich, England. Vapor pressure: The pressure exerted by water molecules in a given volume of the atmosphere. It is a measure of the contribution of water vapor to the total pressure. Velocity: The change of direction and position of an object with time. Visibility: The maximum horizontal distance at which objects can be identified. Visible radiation: Electromagnetic radiation with wavelengths between approximately .4 to .7 microns. Human vision occurs at these wavelengths. Wall cloud: A lowered region of rotating cloud underneath the rear of a severe thunderstorm from which a tornado may form. A wall cloud marks a very strong updraft. Warm front: A front in which cool air is replaced by warmer air. Warnings: Issued when a hazardous weather is occurring or about to occur. Watches: Issued when the risk of hazardous weather is significant. Waterspout: A type of whirlwind that forms underneath cumulus clouds over a large body of water. Watt: A unit of power or energy per unit time. Wavelength: The distance between one crest of a wave and another. Weather: The current state of the atmosphere at a particular location. Wien's Law: A radiation law that describes why hotter objects give off most of their radiant energy at shorter wavelengths than do cooler objects. Wind shear: The change of wind speed and/or direction in the atmosphere along a given direction. Windsocks: Used to estimate wind speed and direction at airports. Work: The distance traveled by an object multiplied by the force applied to it in that direction. Zenith: The point directly above an observer.